Modelling can be very tiring, with super long days, repetitive shots or scenes and the obvious hair and make-up time, so these models were pretty delighted to be tucked up for their recent shoot! Commercial models get booked for such a variety of different work, you never know what the next modelling job is going to be! Models Direct have soured models for all different types of assignments over 28 years, so not many briefs surprise our assignments team! 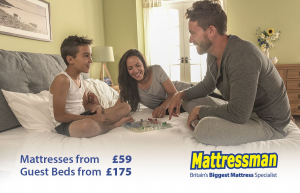 These models were delighted to be selected for this shoot with Mattressman, what a nice shoot to do and be paid for! Most of us would happily be paid for being in our pj’s and having a nap . Models Direct represent men, women and children who are talented individuals and commercial models, furniture companies use alot of commercial models to promote their products, here are a few final images from recent shoots Models Direct have done with Mattressman. This entry was posted in Commercial Models, Family Modelling, female model, male model, modelling, Models, Models Direct, Talent and tagged commercial models, Furniture, Matressman, Norwich, Promotional, UK by The Models Direct Admin. Bookmark the permalink.